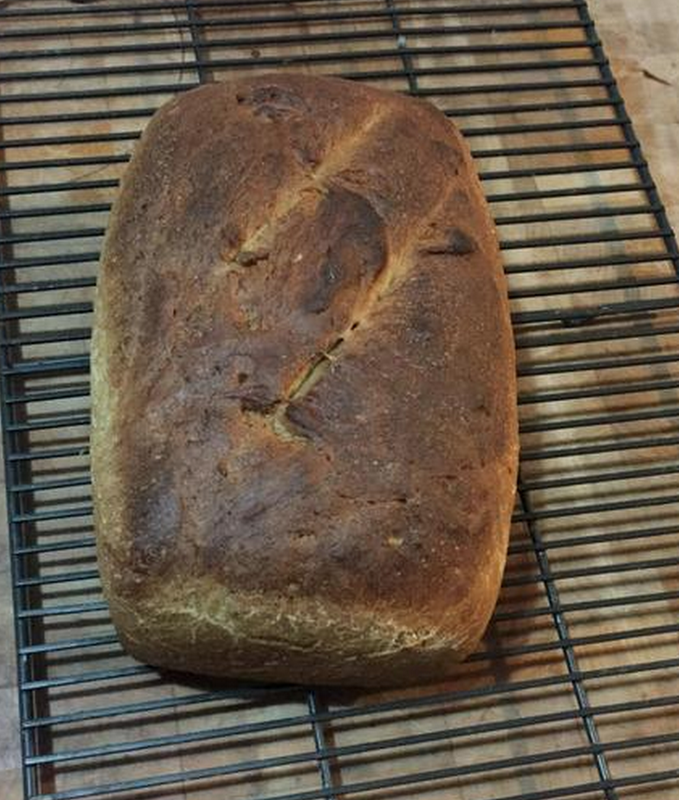 Easy bread to make, great dough, smells fantastic, has milk and eggs so it will last. Makes amazing french toasts, too. Recipe from the Red Star website. In large mixer bowl, combine 2 cups flour, yeast, sugar and salt; mix well. In saucepan, heat water, milk and shortening/butter until warm (120-130°F; shortening/butter does not need to melt). Add to flour mixture. Slowly add slightly beaten eggs. Blend at low speed until moistened; beat 3 minutes at medium speed. By hand, gradually stir in enough remaining flour to make a firm dough. Knead on floured surface until smooth and elastic, 5 to 8 minutes. Place dough in lightly oiled bowl and turn to grease top. Cover; let rise until dough tests ripe, about an hour. Punch down dough. Divide into 3 parts. On lightly floured surface, roll each third to a 15-inch rope. On cookie sheet lined with a Silpat, loosely braid from center to ends. Pinch ends and tuck under to seal. Cover; let rise in warm place until indentation remains after lightly touching, about 30-45 minutes. Brush with egg wash. Bake at 400°F for 25 to 30 minutes until golden brown. Remove from cookie sheet; cool on wire rack. I have always loved applesauce but not so much the store bought. I am a diabetic and it usually has too much added sugar. So on Friday, I went to Sam’s and they had a big bag of beautiful gala apples and decided to buy them. Ate one with some cheese, crackers and salami to try them and it so was sweet. Now on to hunt for a recipe. I had read somewhere you could do it in the slow cooker so after reviewing several recipes I decided to do my own. It came out really good. These are the ingredients. You place the apples in the slow cooker in layers. It will come almost to the top. That is why it must be thin slices. Sprinkle with cinnamon and nutmeg. Pour ½ cup of water. Put slow cooker in high for 5 hours. Stir occasionally (I stirred once every hour). When finished and cooled a bit, puree with an immersion blender, regular blender or food processor. Serve with pork (we served it with pork belly, DIVINE) or ham or anything you wish. It is even better the next day. I have been wanting to do a stout beer bread for a while. After reviewing dozens of recipes, I decided to make my own. This is it. Dump all dry ingredients in a bowl (I used the mixer’s bowl) and add the liquid ones and mix. In the mixer using the hook, knead at first setting for 2 minutes, then in second setting for 3 minutes and then third setting for 2 minutes. If by hand, knead for 10 minutes until firm but it will be sticky. Oil (I used olive oil) a bowl and let the bread rise for two hours, folding the bread after one hour. Put in in a 9X5X2 pan for half an hour, put the oven in 430 degrees and let the bread rest for half an hour. Splash about an ounce of water in the bottom of the oven, slash the top of the bread and pop it in the oven for 28 minutes. The top will be brown and beautiful and beery, with great crust . NOTE: If you use a less potent beer or more water and less beer, the strong stout taste will be reduced. Its up to you.